Three important facts are related to this title, the first is the appearance of the Virgin Mary in 1519 calling for the construction of a church and announcing that going to pour gifts. The second is in 1638 when a novena to Our Lady of Thanks Cotignac gives the Queen a son who will Louis XIV. And the third in 1660 when San José appears and a water arises. Cotignac is a French commune, located in the region of Provence, department of Var in Brignoles district and canton of Cotignac. The August 10, 1519, a lumberjack named Jean de la Baume Verdaille climbed Mount, overlooking the village of Cotignac. As usual, he began his working day kneeling to pray. Then, when standing was involved in a cloud where the Virgin appeared with the Child Jesus in her arms, flanked by San Bernardo and San Miguel Archangel. The Lady with a crescent under her feet, went to Jean de la Baume saying, "I am the Virgin Mary. Go and tell the clergy and the Consuls of Cotignac me right here to build a church, dedicated to OUR LADY OF YOU,., And come in procession to receive the gifts that I want to deliver there " Then the vision disappeared. Only after a second appearance, the next day and in the same place, the woodcutter dared to convey the heavenly message. As was serious and reputed pious man, five weeks later, on September 14, the feast of the Exaltation of the Holy Cross, residents and councilors of Cotignac came in procession and began construction of the first chapel, which will soon be too small, as many miracles began to happen, pilgrimages took a big boom. Coming soon - even from 1522 - official pilgrimages came from cities like Aix-en-Provence to implore the protection of the Virgin to epidemics of plague (it never suffered Cotignac) and other hazards. And Our Lady of Grace soon acquired fame advocate for women who have difficulty conceiving or carrying through your pregnancy. Following the description given by Jean de la Baume, a beautiful portrait of the Virgin with the Child Jesus in her arms was painted, is still venerated. To cater to the pilgrims, in the sixteenth century a community of Oratorian Fathers established. The most famous of the gifts of the Virgin in Cotignac was the birth of the future King Louis XIV in 1638, after three ninths made by Queen Anne of Austria, one of which was specifically aimed at "Notre-Dame des Graces" of Cotignac. Unable to have a descendant, Queen Anne of Austria had to publicly ask them to do in his name three ninths of prayers to the Blessed Virgin to give him a son. 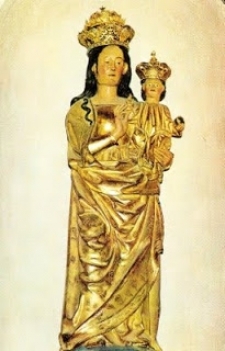 The first would novena to Our Lady of Grace in Provence, the second to Notre-Dame Cathedral and the third Notre-Dame des Victoires, the church of his convent. On November 3 at 2 in the morning, the pious brother in his cell was taken from his sentence by the cries of children. With surprise in front of the Virgin Mary, showing her in her arms a child: "Fear not, she says, I am the Mother of God, and the child you see is the dolphin that God wants to give to France." And the vision disappears, then reappears a short but without a word, and finally, two hours later, Mary again, one time, and said: "Do not doubt my son you've told your confessor. I want to warn you that the Queen will make three novenas my honor, the very image of Our Lady of Graces, in Provence "
On November 5 wrote a record of all this and the whole community of Augustinian counter-signed, for Cardinal de la Rochefoucauld. Because of this, the three novenas became an affair of state. Under strong inner sense, November 8, 1637, Brother Fiacre had begun three ninths on behalf of the Queen. Ended on December 5, as observed the biography of Venerable Brother, "just nine months before the birth of the future King Louis XIV". In early February 1638, the Queen felt the child moving in her and had the desire to meet the famous Brother Fiacre. Religious humble is forced to go to the Louvre, where he was confused to see the Queen kneel before him and thank him. Here's how Anne of Austria demonstrated its confidence in the successful outcome of pregnancy. Since 1635 France was at war with Spain, the idea of making a vow and dedicate the entire country to Notre Dame was in the air. Louis XIII, the pious king, had already outlined the various forms of consecration, advised by her confessor, Caussin Father, and in November 1637 a text finally submitted to Parliament and signed by the King on February 10, 1638 Known as the famous vow of Louis XIII, (that will be remembered each year on the Feast of the Assumption of Mary, August 15). Caussin father, according to his biography, he proposed to the king to enact the consecration of France as soon as there is no doubt about the pregnancy of the Queen, in February 1638 was two months pregnant. The regent Anne of Austria and King Louis XIV at the beginning of his reign, will have the opportunity to come to Cotignac. This opportunity was given by the Treaty of the Pyrenees in 1659 reconciliation between France and Spain. It was scheduled a meeting of the two kings at the border. It will be Saturday February 21 the royal procession reaches Cotignac. Thus, in February 1660, the young King Louis XIV was the Queen in person to the shrine to give thanks for his birth. A plate left by both memory of this visit is retained. The young king, who was 21, also donated his gold ring and a long light blue lace dirty, the prestigious order of knighthood of the Holy Spirit. On 1 January 1684, knowing Brother Fiacre was going to die soon showed his will to his superior who was a little surprised and handed a letter to send to the king after his death, and said that would make possible the realization of this desire, which actually was. Two weeks after returning to God the venerable brother, Louis XIV wrote to the Oratory Fathers Cotignac request to receive the heart of Brother Fiacre in his church, where he still remains. A plate showing the location on the left wall, where it was placed. Cotignac also preserves to this day "Holy Power Bessillon Joseph" which originated the June 7, 1660 and that the only appearance of San Jose that is officially recognized by our Holy Mother the Church recalls. The fact was simple: on Mount Bessillon, a young shepherd named Gaspard Ricard, was grazing his sheep in the midst of intense heat. Exhausted by thirst lay under the bright sun, when behold a man of imposing stature who approaches you and tells you a rock appears to him saying: "I am Joseph, lift it up and drink." The stone was heavy - eight men later could barely move - Gaspar thought it was a joke when the 'Ancient One' - as have the contemporary accounts - repeated the order. Gaspard obeyed and moved the rock without difficulty uncovering a fresh water began to emerge. Drank greedily and when he realized he was alone again. "That's it (tell the Bishop of Fréjus-Toulon, in a pastoral letter of 1 February 1917), as in the Gospel, San Jose is not chatty. Nothing more simple, or poorer than this intervention, which is, in my opinion, the only occurrence of this kind of San José, in the history of the Church, in a land that was already reserved for itself Our Lady '. Gaspard did not doubt the reality of the fact, nor the inhabitants of Cotignac. The news spread with extraordinary speed, pilgrims flocked to the source from all parts of the province and neighboring countries; sick of every kind or returned cured, comforted in their sickness. In 1663 a chapel that is still possible to see where you can read the inscription devoted prophet Isaiah: "You will draw water joyfully from the springs of salvation." With the advent of the French Revolution, chapel and convent had to be abandoned. The monastery fell into ruins but the chapel survived thanks to the request of the parishioners and priests of Cotignac. Two or three times a year it was open to the devotion of the faithful and especially on March 19 Cotignac was to honor the great saint. Bishop said the same in another letter: "Surely, we have forgotten too the privilege of this holy patriarch to visit one of the most humble children of our land. He has retired again in silence, but the source is emerging as a testimony of their. There was a time when the pilgrims came to pray in larger group. In the joys and hopes, the griefs and anxieties of the time, what lessons we can learn from San Jose fair, attentive and silent benefactor. What thanksgiving we have to ask for humanity, for the Church is Patron, for our country and for our diocese. " Lord heard the prayer of the bishop and conveyed when the resurrection of those places. In the holy year 1975 came to France Benedictines of "Monastery of Saint Benoît de Medea" (Algeria), thus giving life back to the Shrine of Bessillon.